Hot tubs and spas can be made accessible with the installation of a fixed Hot Tub or Spa Hoist, also commonly known as a lift. This means that people who have limited mobility or are disabled can enjoy the luxury of the bubbles and relax knowing they are able to safely get out of the water at their leisure and they can enjoy all the benefits of water therapy. 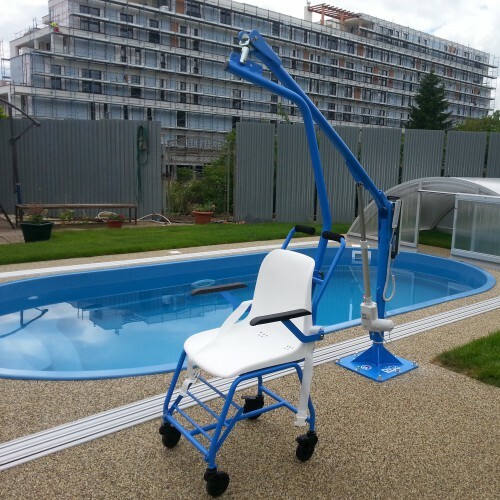 Some Hot Tub and Spa Hoists/Lifts are installed by being fixed onto a concrete pad or base, other models require drilling into the ground for secure fixing. Installation can be carried out by one of our fully trained engineering staff, alternatively you can arrange for your own installation and we will provide full instructions for this. Our range of products are either battery or manually operated. Products like the Spa Ultra, Spa Elite and F100M are fully automatic for independent operation they even turn left and right. Each of these products have been designed to offer a great user experience. All our lifts & hoists comply with DDA regulations and are CE Mark to indicate that they conform with relevant EU directives regarding health and safety. We can help advise you on the best access solution for your hot tub/spa/jacuzzi.